She worked for 31 years in the public schools in Puerto Rico. Through her, I learned to love the honesty and spontaneity that little ones have. I love my job even if some teachers and parents don't feel comfortable with the fact that I'm a young early childhood teacher. Thanks for your attention in my story. Greetings. 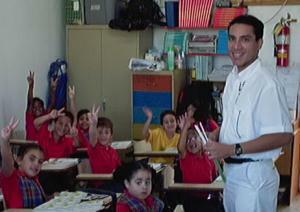 I had the opportunity to tell my story as a first grade teacher in 2007 in Puerto Rico. Many things have happened since that publication. Since completing my Masters, I started my PhD and direct the kindergarten program in the Department of Education. At present, I wait 14 years for became kindergarten teacher. I'd love to tell my story and update all the achievements and struggles that I have encountered in my 16 years as a teacher on the island of Puerto Rico.